Spotify is testing a tool that will enable independent artists and labels to upload their music directly to the streaming service, without having to go through a distributor. The company has quietly been testing this feature with a few DIY artists and small labels, but is now opening it up to “a few hundred” US-based artists, via invitations, but with the aim of expanding that to more artists, labels and management teams in the future. This is separate – but strategically related – to Spotify’s experiments with licensing music directly from artists, which were revealed earlier this year. Unlike those deals, the new direct-upload tool does not involve paying advances to artists. It’s purely a means for them to put their music on Spotify without going through a middleman. There are significant implications here: for the distributors who currently play that role, including the in-house distribution and label-services divisions of the three major labels; for the artists and independent labels who will get 100% of their royalties under Spotify’s new system; and for rival streaming services who may feel encouraged (or even obliged) to follow suit. Spotify is presenting the news as a response to demand from artists. “For years, one of the most common requests we’ve gotten from artists is to provide a simple and direct way to get their music on to Spotify,” Kene Anoliefo, senior product lead on Spotify’s creator marketplace team, told Music Ally in an interview ahead of the announcement. The new tool enables artists and labels to upload their music and its metadata – songwriter and publishing details included – as well as previewing how their release will look on Spotify, and then making tweaks after it goes live on the streaming service. 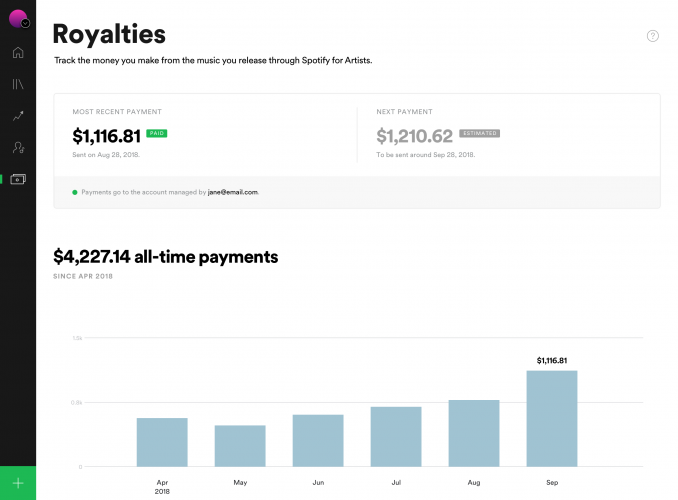 Spotify will pay out royalties to these artists on a monthly basis, and will add a ‘royalties dashboard’ to its existing Spotify for Artists analytics tools so they can track their earnings: and not just those in the past. 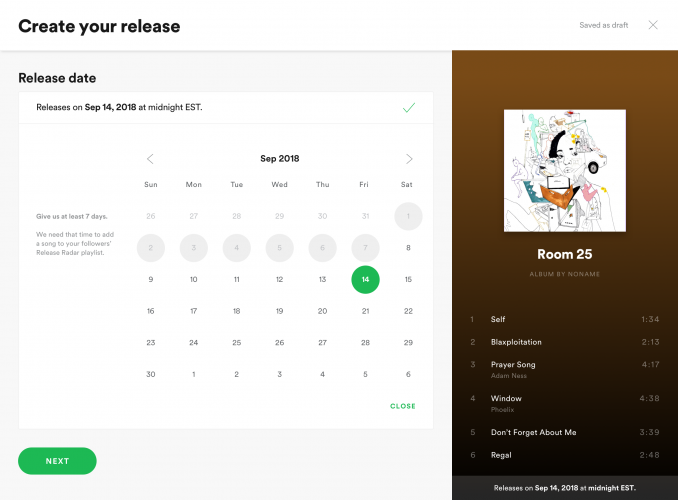 Artists distributing directly on Spotify will also be able to release music as often as they like – Anoliefo said that one of the artists in the first tests released four albums in a month at weekly intervals, for example. Spotify will not charge or take a commission. Independent artists Noname, Michael Brun, VIAA and Hot Shade are some of the musicians who’ve been testing the tool already. If you browse the ‘About’ section of their Spotify profiles, you’ll notice that their music is currently being discovered on some popular playlists, up to and including New Music Friday. Are they getting special treatment? Anoliefo said that there is no fast-track to Spotify’s playlist curators here. The new tool will be business as usual for Spotify in terms of songwriters and publishing, meanwhile. “The content that is uploaded through Spotify for Artists will be treated no differently. Spotify will account to publishers and collecting societies,” she said, while suggesting that the new tool’s emphasis on accurate metadata will have a positive impact. For now, the expanded test of the new direct-upload feature will be invitation-only: Spotify is choosing US-based artists who are “heavily-engaged” in using its existing Spotify for Artists tools, and who are releasing music “quite frequently” – as the company hopes this will generate the most-useful feedback. Other artists can sign up for a mailing list to register their interest in getting access as and when the tests expand further. 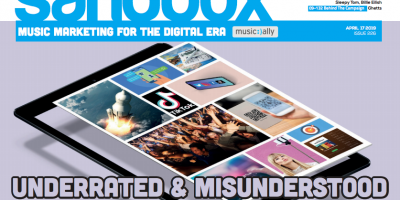 It’s clear that the logical endpoint for this test is to open up direct uploads to all artists and independent labels, although Spotify is steering clear of grand statements on this front: Anoliefo said merely that “the goal of the beta test is to learn”. That, surely, is as much about learning how the major labels react to the news ahead of their fast-approaching licence-renewal negotiations with Spotify, as it is about learning how artists use the tool. The company has been carefully making a pitch for its ‘two-sided marketplace’ in recent months, emphasising tools that can benefit labels as well as artists. However, the reports of its direct-licensing deals have created genuine tensions around Spotify’s relationships with the majors, as the latter assess how the streaming service will evolve in the future. Today’s news will feed in to that unsettled mood ahead of the cut and thrust of the licence renewals. Is Spotify’s direct-upload tool a ‘distributor-killer’ in its current form? Clearly not, particularly as it’s a single-service tool: “Artists are free to distribute their music to other platforms, and because the tool is only for Spotify, they’ll need to have a relationship with a distributor or aggregator,” is how Anoliefo put it. But think of the longer game here, especially if Apple Music, Amazon Music Unlimited, Deezer and others follow suit. Even if all the big streaming services offer direct-upload tools, it’s not a death-knell for distributors in itself. Basic distribution – getting music onto the digital service providers (DSPs) – is already highly commodified. Most of the companies in this sector already place more emphasis on other services beyond that: digital marketing, playlist pitching, analytics that pull in data from multiple DSPs, sync licensing and more. With hundreds of DSPs worldwide, there will still a role for basic distribution to mop up the niche and local players for some time to come, but the trend of distributors working hard on ‘added-value’ services is already well-established – today’s news may simply focus more minds on it within these companies. The response of major labels will be fascinating to watch, however. Their in-house distribution / label-services arms (The Orchard for Sony Music, Caroline for Universal Music, ADA for Warner Music etc) are important components of their growth, even if that sometimes flies under the radar of the industry. The prospect of independent labels going direct rather than through these companies is disruptive in one particular way: the ongoing argument over how recorded-music market shares are measured. And specifically whether they’re measured by distribution (in which case the major-distributed indies count towards the major labels’ market shares) or by ownership (in which case they count towards the other piece of the pie: the independents’ share). Anything that brings independent artists and labels out of those major-owned distributors has potential ramifications for this debate. Yet again, it’s less of an existential threat, and more of a challenge to the distributors to justify their value through their other services. So, beware of hot air around today’s news: call clickbait-shenanigans on any publication that goes down the ‘SPOTIFY’S NEW TOOL IS A LABEL-KILLER!! !’ path. The implications are much more nuanced, but still hugely important for the way our industry develops. It doesn’t lend itself as well to all-caps headlines with exclamation marks, but it’s a much more useful lens through which to view today’s news, and the industry trends more generally. That said, the fact that Spotify’s direct-upload tool isn’t an instant, existential threat to labels and distributors does not mean that a number of those labels and distributors won’t feel instantly, and in some cases existentially, threatened by it. The ructions from those feelings will be played out in public, but also in private at the negotiating table.